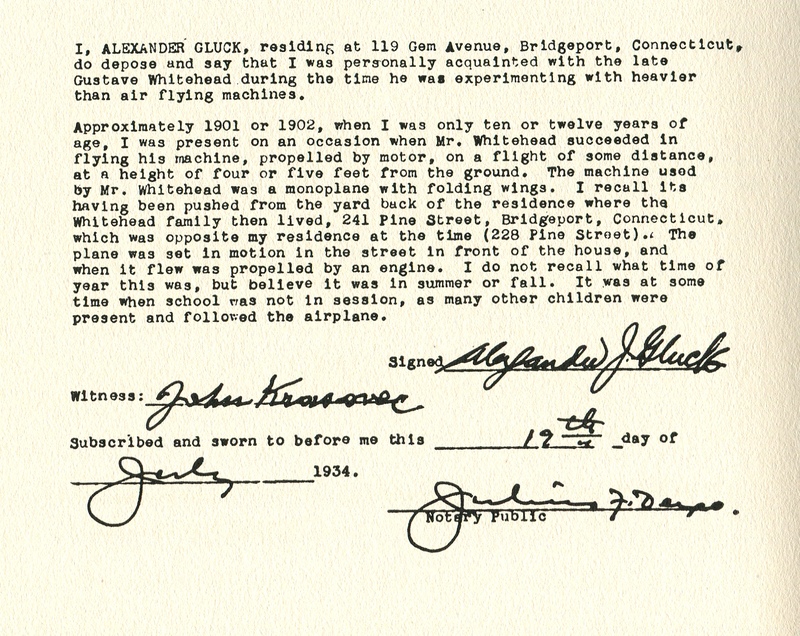 I, ALEXANDER GLUCK, residing at 119 Gem Avenue, Bridgeport, Connecticut, do depose and say that I was personally acquainted with the late Gustave Whitehead during the tine he wal experimenting with heavier than air flying machines. Approximately 1901 or 1902, when I was only ten or twelve years of age, I was present on an occasion when Mr. Whitehead succeeded In flying his machine, propelled by motor, on a flight of some distance, at ft height of four or five feet from the ground. The machine used By Mr. Whitehead was a monoplane with folding wings. I recall Its having been pushed from the yard back of the residence where the whitehead family then lived, 241 Pine Street, Bridgeport, Connecticut, which was opposite my residence at the time (228 Pine Street).i The plane was set In motion In the street In front of the house, and when It flew was propelled by an engine. I do not recall what time of year this was, but believe It was In summer or fall. It yas at some tine when school "as not In session, as many other children were present and folloreed the airplane.